Although this blog reviews things other than books, and indeed, at times I stray off track into various different subjects, it is primarily a site about books. Ones that I have read in the past, as well as ones that I am currently reading. So, it would be remiss of me to overlook the news item that caught my eye this morning concerning HarperCollins and their plan, make that policy, to charge libraries a fee for each time an e-book is lent out after the 26th time. The impact that this would have on the Public Libraries as a whole, at a time in which library funds are being slashed across the country, is staggering. The libraries, underfunded as they are, will have no choice but to pass the fees along to their patrons. Many will be unable to afford the fees. Let's examine that scenario for a moment. Back when Benjamin Franklin began the library system, books were very expensive and not many people could afford them. That was the impetus behind creating a Public Library to begin with. It was a way to help the public learn, to broaden their horizons and soar among the words of the great philosophers, poets and essayists. It was a noble endeavor embarked upon by the need to have an educated populace, as ignorance serves no legitimate purpose in any society. Fast forward a few hundred years to the 20th Century. Libraries were built with the help of the wealthy, for use by the less fortunate. 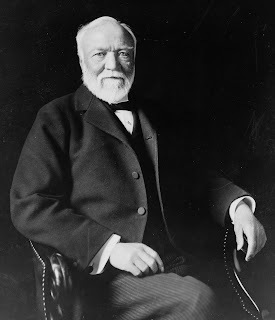 Andrew Carnegie, pictured above, comes to mind as a prime example. For my entire life, and that of our parents, the Public Library has always been there for us. They have rolled with the times, adding music and videos to their collections, reflecting the changing culture of the times. And it has worked out rather well. There are now more literate people than at any time in our previous history. And we were able to accomplish that without charging fees. Let's look at it this way, the average classroom size is about 35 students. Let's say the class is assigned to read "To Kill A Mockingbird." There are 4 copies of the book in the school library, 3 paper copies and 4 e-books in the Public Library. That's 11 copies for one class to share. Wait! I forgot! There's more than one school in the area of the library. So, that means that most of the students will have to purchase the book to satisfy the assignment. Not a very promising outlook, is it? One can't help but wonder where this will all lead. As traditional paper books give way to the e-book, what will happen to those who can't afford the fees to read? What future is in store for a society in which books are reserved for those with money? Victorian England and Charles Dickens both come to mind. Remember the part in "Oliver Twist" when Oliver is charged with the theft of a book from a bookseller - there were no public libraries in England at the time - is that where we are heading? Perhaps HarperCollins will be doing away with printed materials altogether, eschewing them in favor of a new technology which will reward them handsomely? It's not unthinkable that eventually HarperCollins will take their entire inventory to e-books, thus eliminating many titles from the Public Libraries, replacing them with e-books which will generate a greater profit. I called HarperCollins in New York about 2 hours ago. I was passed along to 2 voice mails, and then upon my insistence was permitted to speak with a live human being, at no additional charge. This person took my name and number and promised to pass my message along. I will print the response here, should I ever receive one. In the meantime, if you care about books, libraries and reading in general, do us all a favor and make the call to HarperCollins. Let them know how you feel about this new policy. You can reach them at 212-207-7000. And if you are reading anything by Sarah Palin, Michael Crichton or Anne Rice, please contact them and let them know it is time to change publishers. •Every citizen has the right of free access to community-owned resources.